When the user account control dialog pops up, the screen automatically darkens and Windows deactivates the currently running process. You would like to turn off this irritating behavior. In order to change the system behaviour when the user account control is called up, an entry in the registry is necessary. For this, open the registration editor with the key combination [Win]+[R], followed by the command ‘regedit’ in the dialogue ‘Run’. Then, navigate to the key ‘HKEY_LOCAL_MACHINE\SOFTWARE\Microsoft\Windows\CurrentVersion\policies\system’. Now, in the right side of the window, open the entry ‘PromptOnSecureDesktop’ for editing. Set the value from ‘1’ to ‘0’ and confirm this with ‘OK’. The change is effective immediately without having to restart the system. 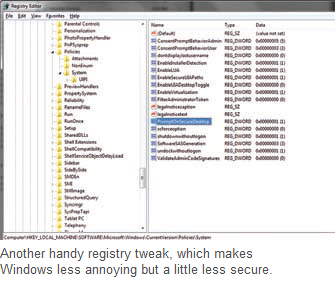 You can try it out by starting the Registry editor again because the user accounts manager kicks in every time with this. To activate the standard settings again later, just change the value from ‘0’ to ‘1’.